FOR SALE: DINING TABLE AND WOMB CHAIR! This beaut of a dining table (also seen here) is made from reclaimed wood and is 6′ long X 32.5″ wide. We’re asking $800 for it and it can either be picked up here in Palm Springs of we can deliver to San Diego or Los Angeles (additional delivery expenses will apply). Or if you’re somewhere else in the country and want to make it yours, we can investigate shipping rates for dometic freight. Email me at hello@ahouseinthehills.com if you’re interested! Ok, so I have this thing about chairs. And by thing I mean MILD OBSESSION THAT BORDERS ON PSYCHOTIC. 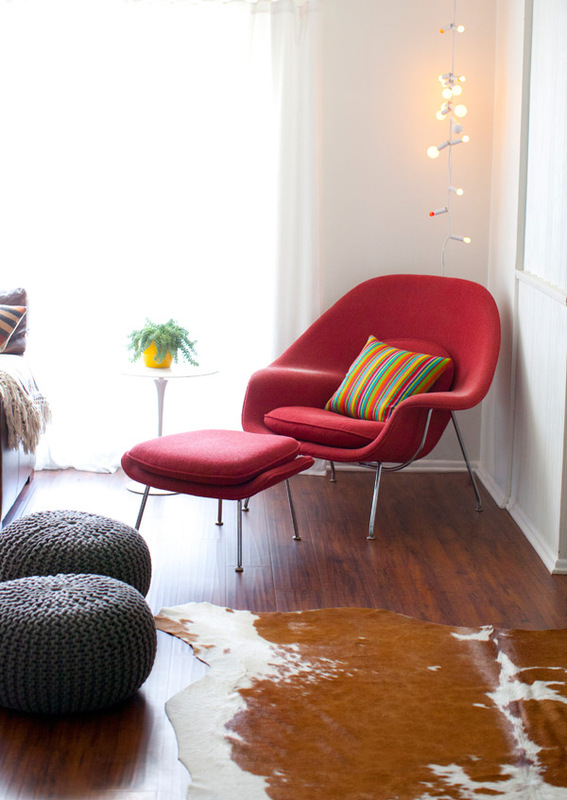 And the red womb chair (see specs here) was the at the top of my chair obsession list. I stalked it, daydreamed about it, put it on my vision board, I knew that one day I’d make it my own. And when that day came it was so much more than a chair to me, it meant I’d made it. Whatever that means. Anyway, I love this chair. LOVE IT. But it’s not right for our house (I’ve tried to find a way to make it work for the past year but it’s ended up in the corner in our dining room seeing no love at all). So it’s time for me to part with it. 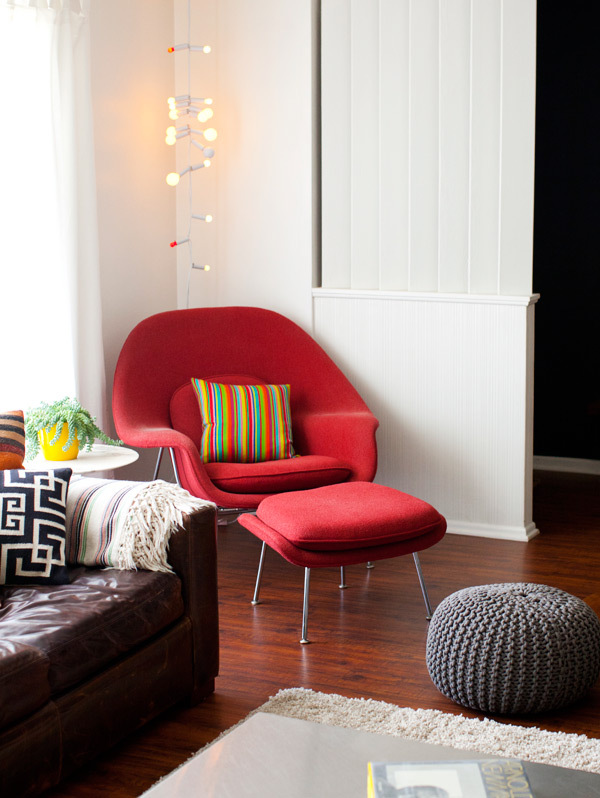 Here’s the deal: it’s vintage red boucle, the classic Saarinen material, comes with the ottoman. I don’t know how old it is, we bought it at Boomerang for Modern in San Diego. It has some fading on one of the arms, and a small tear in the same place. It’s not in pristine condition, but it’s in good vintage condition. I can send detail photos of the wear. We’d love to sell it for $1300 (OBO), but most importantly I want it to go to someone who will love it the way I have. Will deliver to Los Angeles or San Diego, minimal fees if I can fit it in the back of my car (which I think I can). Will travel nationwide with shipping costs additional. Help me find this amazing chair an amazing home! Email hello@ahouseinthehills.com for more info. 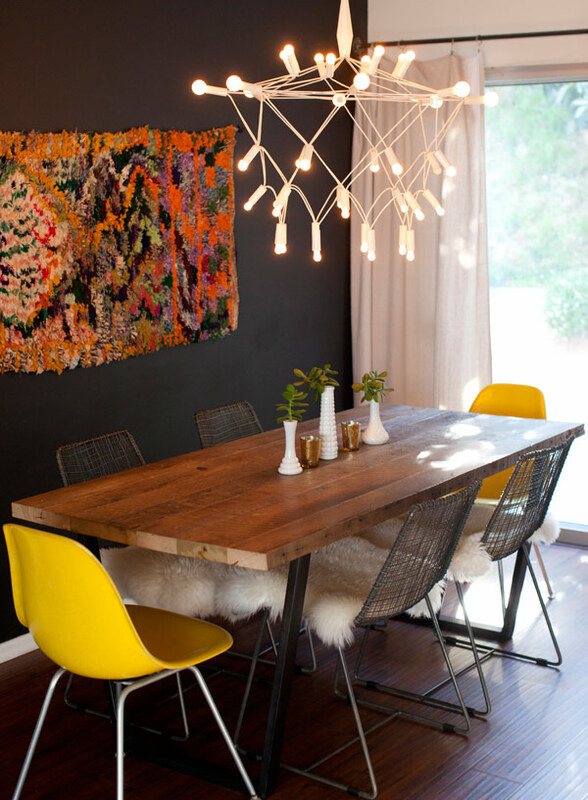 your dining area is stunning. I love the pops of yellows in the chairs. 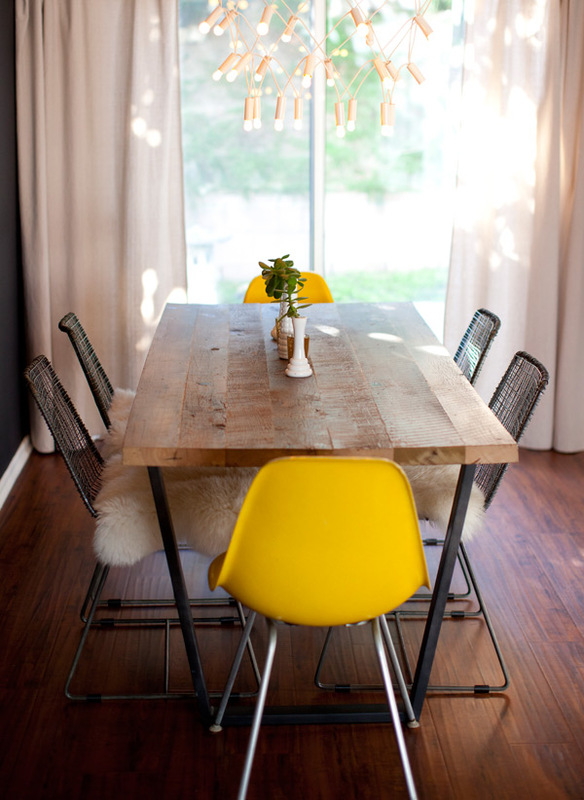 LOVE that dining table – I wish I had room for it!!! Darn, I really wish we were in the LA area, we're in the market for a new table, but I have a feeling freight costs would put this out of our budget. It's gorgeous though! Funny, I'm getting rid of major beloved pieces too. Feel better having the virtual support of a like-minded, um total stranger! via the internet, but hey – it helps! Beautiful pieces, am sure they'll find appreciative new homes. Where is the chandelier over your table from?! I LOVE it!!!! If I lived closer I'd consider it! is the table still available? Wow amazing decoration to our home I really like It thanks a lot for sharing .. btw I really like ur blog.. Safe to assume all this gorgeous furniture is long gone by now? Never hurts to ask. We live in NoHo.